LANSING – Michigan Attorney General Bill Schuette announced his Consumer Protection team has released a new consumer alert on “Smishing.” Smishing is when a scammer sends text messages to consumers appearing to be from a trusted source. Smishing scams are like phishing scams for emails except they arrive as text messages. The scammer’s goal is for consumers to respond to the texts with personal information or to click on links that install malware. Are You Satisfied with your Skip Tracing Solutions and Strategies? Join us at the Skip Strategies and Solutions Session at DCS2018. Hear from the experts in this half-day special event with 4 Distinctly Different Skip Panels. Moderated by Mike Goins of TD Bank. A half-day of strategies and techniques from the expert creditor panels, and a Special Solutions Provider Hour – with 20 top solution providers: Hear the 3 minute elevator pitches from: Carfax, Central Research, Del Mar, DRN, Experian, Innovis, LexisNexis, LocateSmarter, masterQueue, Primeritus, RNN, TransUnion, VeriFacts. (CNN)The Consumer Financial Protection Bureau says the Department of Education is blocking access to documents it needs for its lawsuit against Navient, one of the nation's biggest student loan servicers. The Bureau of Consumer Financial Protection (BCFP) is prioritizing supervision over the credit reporting agencies, said a bureau representative during testimony Thursday before the Senate Banking Committee. NAFCU has stressed that the credit bureaus should be examined for data security compliance and held accountable when negligent. Scammers are constantly finding new ways to steal money from their victims, and anyone can potentially be a target. The Bureau is part of a new Task Force on Market Integrity and Consumer Fraud, created by the President pursuant to an Executive Order. The Task Force will provide guidance for the investigation and prosecution of cases involving fraud on the government, the financial markets, and consumers, including cyber-fraud and other fraud targeting the elderly, service members, and veterans. IRVINE — For nearly two years, the Irvine Co. has been quietly sharing information from automated license plate readers at three Orange County shopping centers with a surveillance technology vendor that sells data to Immigration & Customs Enforcement, raising privacy concerns from civil libertarians. Ahead of today's Senate Banking Committee hearing to examine credit bureaus and the Fair Credit Reporting Act (FCRA), NAFCU's Carrie Hunt wrote in support of "a strong, robust and secure credit bureau system." However, in the wake of the data breach at Equifax, Hunt stressed that the credit bureaus should be examined for data security compliance and held accountable when negligent. FCC plans to stop reviewing informal complaints—filing a formal one to cost $225. Ajit Pai's Federal Communications Commission is proposing that it stop reviewing the vast majority of consumer complaints about telecom companies. Going forward, consumers harmed by broadband, TV, and phone companies would have to pay $225 in order to get an FCC review of their complaints. The Consumer Financial Protection Bureau is likely to face one of its toughest critics at the Supreme Court if President Donald Trump's pick, Brett Kavanaugh, is confirmed by the Senate. Kavanaugh, a judge on the D.C. Circuit Court of Appeals, has repeatedly ruled that the structure of the consumer watchdog is unconstitutional. COLUMBUS, Ohio - The Ohio Senate passed a bill Tuesday afternoon that promises to rein in payday lending -- though the bill has at least one more stop before it could be sent to Gov. John Kasich's desk. Senators voted 21 to 9 for a version of House Bill 123 that ensures payday lenders abide by a 28 percent interest rate cap for loans up to $1,000 for up to 12 months. Knoxville, TN – July 11, 2018 – Reliant Account Management (RAM) announces a strategic and operational partnership with Telrock, a global SaaS provider of digital channel customer engagement tools used by creditors and collection professionals across the credit lifecycle. The partnership combines the expertise of both companies to improve how consumers enrolled in debt relief programs can more efficiently and effectively engage in payment transactions and related communications by leveraging Telrock’s advanced digital channel communications platform. EARLY BIRD RATE FOR DCS2018 ENDS AUGUST 17! 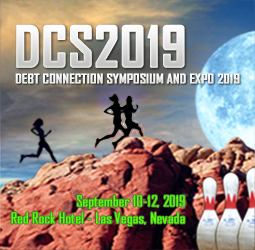 Debt Connection Symposium and Expo 2018 will be held on September 5 – 7, 2018 at the JW Marriott Austin in Austin, Texas. There is an early bird rate of $1,295 that will end on August 17, 2018, and on August 18, the rate goes up to $1,395. Register today to get the early bird rate! NAFCU, in a letter Monday to the Bureau of Consumer Financial Protection, offered ways for the bureau to improve its education programs to strengthen consumers' financial literacy. NAFCU's top recommendation was for the bureau to collaborate with the NCUA and partner with credit unions to distribute financial resources more effectively throughout communities. Health-care-related bankruptcies, touted as a key justification for passing Obamacare in 2010, are not nearly as prevalent as reform proponents such as Sen. Elizabeth Warren have claimed, researchers say. Findings of an exhaustive report published in the American Economic Review this year have sparked a lively debate as the Trump administration rolls back key portions of the health care law. Matthew Notowidigdo, an associate professor of economics at Northwestern University, and fellow researchers looked at the rate of first-time health emergencies and resulting debt levels for patients. The result: About 4 percent of insured patients and 6 percent of uninsured patients ended up filing for bankruptcy. A former aide to the top congressional critic of the Consumer Financial Protection Bureau will now serve as the No. 2 official at the agency. Acting CFPB Director Mick Mulvaney announced Monday afternoon that he had selected as deputy director Brian Johnson, an aide who had joined him at the agency after working for House Financial Services Committee Chairman Jeb Hensarling, R-Texas. Johnson will replace Leandra English, the Obama holdover who had pressed a legal claim that she, and not Mulvaney, should be the acting director of the agency. English announced Fridaythat she would drop the suit and leave the agency. ALEXANDRIA, Va. - At the year’s halfway point, bankruptcy filings are down year-over-year, according to figures distributed by the American Bankruptcy Institute. Data provided by Epiq Systems showed total bankruptcy filings during the first six months of the year decreased 3 percent to 388,199 cases, down from the 399,522 total filings during the same period in 2017. Total consumer filings also decreased slightly, decreasing 3 percent to 369,122 during the first six months of this year from the 379,464 total consumer filings during the same period a year ago. WASHINGTON, D.C. — Today, Bureau of Consumer Financial Protection (Bureau) Acting Director Mulvaney today announced he has selected Brian Johnson, who currently serves as Principal Policy Director at the Bureau, to assume the responsibilities of Acting Deputy Director. Greensboro-based FirstPoint Collection Resources, a division of credit-services and receivables management company FirstPoint, announced late Friday that it has acquired Tuscaloosa, Ala.-based Credit Bureau Systems. Credit Bureau Systems has 40 years of experience in debt collection and call center services. According to the announcement, the acquisition of Credit Bureau Systems will result in consolidated operations and new jobs in Greensboro. Company officials were not immediately available to comment further on those details or terms of the acquisition. The Bureau of Consumer Financial Protection(BCFP) has issued guidelines on partial exceptions for small banks and credit unions under the Home Mortgage Disclosure Act (HMDA) rules of the amended Dodd-Frank Act, that is now also known as the Economic Growth, Regulatory Relief, and Consumer Protection Act. According to the BCFP guidance, small banks and credit unions get a partial exemption from HMDA reporting procedures if the institution originated fewer than 500 closed-end mortgage loans in each of the two preceding calendar years. These institutions are also eligible for a partial exemption if they originated fewer than 500 open-end lines of credit in each of the two preceding calendar years. Consumer credit card debt is a bellwether for the overall economy’s health. With that in mind, it may seem to be very good news to hear that Americans repaid $40.3 billion in credit card debt during the first three months of 2018 — the second-highest payoff ever — but considering that the year started with consumers owing more than $1 trillion in credit card debt for first time ever, the news is somewhat less cheery.